Yes, I’m afraid we’re back. I don’t much like it. Sorry the blog dried up – the more of the bread book I wrote the less I found I had to say on the blog. We were very good. We’d get up at 6.00 a.m., work ‘til about 12.00, go up the market and buy some food and have the afternoon off. Bit like heaven. Wednesday was my last free Wednesday. Normally that’s my prepping and, come the evening, my mixing day. 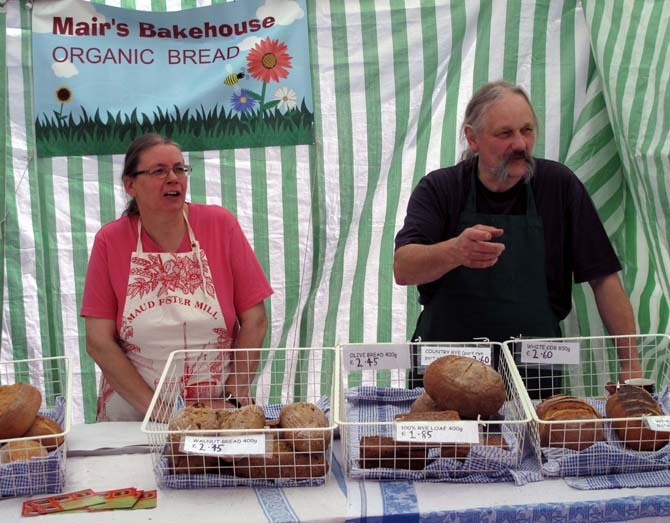 So, we took the opportunity to go and see Rick & Maggie who have a stall at Machynlleth market that day. I say he’s poaching – he’s a bit far North – he should stick to South Wales where he belongs. But as I don’t drive, as I only want to bake two days a week I don’t suppose I can complain. It’s just the principle of the thing. We even went to a session in a local boozer that night. Good to have you back in the country, Mick. Busy, busy here. Pizza nights have taken off like crazy. I think I owe you an email reply but can’t remember if I already did!!! Got your record of lovely photo’s, baking in France, what cohones!